Internet Connectivity: GWCET has 50 Mbps dedicated Internet leased line offers high speed and uninterrupted Internet connectivity from anywhere on the campus, through the campus LAN. Wi-Fi Facility: To provide flexibility & convenient access to network facilities Wi-Fi Network facilities has been provided at the various locations in campus i.e. Auditorium, Director’s Cabin & Conference Room, etc. Firewall: The Campus Network is protected using Fedora Proxy Server Network. Email virus protection is provided through Quick Heal Total Internet Security. The GWCET implements a very strict security policy to ensure the highest levels of network health and safety. E-mail system: The e-mail system, which is the most widely, used service on the GWCET campus, offers a very user-friendly web based e-mail system allows users to access mails, both from inside the campus and outside. Video Conferencing Facility: GWCET has an Internet / ISDN based Video Conferencing Facility setup in the Auditorium. This facility is used for holding global seminars inviting eminent speakers, placement interviews, and virtual student seminars in various programs especially for International Management students. 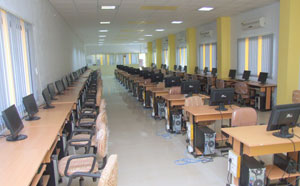 Facilities for GWCET members: Desktop/ Laptop, printer is being provided to the entire GWCET member with internet/Intranet connectivity. All the GWCET members have access to online software package being used for students Grading, Feedback & administrative applications i.e. Leave management system, accounts, admissions & placement.